This one does not taste that bad and was not under high pressure like the DE version. Actually very much like the ones I drank in Hong Kong so thumbs up on the taste of this canned ice coffee. But the design side it very bad I donno who had convince them to use this design because it is totally peanuts. Why a white box for the logo couldn't they just print a white dia positive version on the blue it self. Plus why blue? I would had chosen brown or black to be showing coffee then using blue. Also the cut out coffee beens looks like they were place there to fill up the empty space and not really used a part of a good design. From what I see I think this design was maybe done to stand out to look different then the others, however it does not have to stand out because there are not that much canned ice coffee as I know. Or this was just really crapy done design. The logo design is actually not that bad, from the looks is not the same guy that designed the logo and the can. 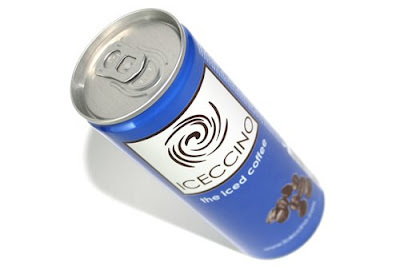 However I visited their website Iceccino.com and they got great designs for the other can and products. But somehow they designed a very ugly can for the Dark Roast version for Albert Heijn though. Not sure if they did it fast and cheap or something else.